Barry Gough, Churchill and Fisher: Titans at the Admiralty. Annapolis: Naval Institute Press, 2017, 640 pages, $39.95, Amazon $36.68. “You are the only man in the world I really love,” Churchill once allegedly told Admiral Fisher, Barry Gough writes. In the long run, not quite. Churchill deeply loved F.E. Smith, Frederick Lindemann, Brendan Bracken, the 9th Duke of Marlborough and probably Lord Beaverbrook. But like Beaverbrook, Fisher was more often a burr under Churchill’s saddle. In May 1915, Fisher’s sudden resignation as Churchill’s First Sea Lord cost young Winston his job as First Lord of the Admiralty. 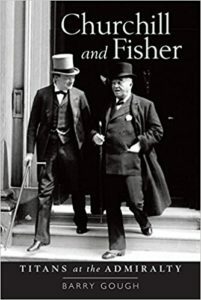 Badly wronged, Churchill nevertheless urged Fisher’s reappointment a year later. Fisher for his part could not be called a lover of Churchill. Rather, he served as a kind of Lucy in “Peanuts,” forever jerking away the football Churchill, like Charlie Brown, could never resist trying to kick. This is a hugely important book, with emphasis on “huge.” It is not a volume you would be wise to drop on your foot. Yet it is highly readable landmark study that updates our understanding of Churchill at the Admiralty (1911-15), and his top naval commander (1914-15). Dr. Gough, an emeritus professor at Wilfrid Laurier University, is the author of a string of insightful studies of the Royal Navy. Here he takes readers back to the years Churchill and Fisher ruled the military service that ruled the waves. 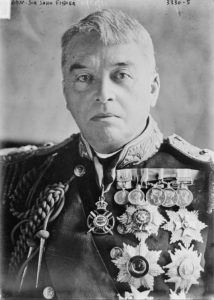 Fisher had largely shaped the Royal Navy as First Sea Lord well before World War I. The inspiration behind the innovative Dreadnought-class battleship, he focused on the German High Seas Fleet as Britain’s most likely adversary. A driving man filled with ideas, he lacked patience with those who couldn’t see the world as he did. Thus Fisher made more than a few enemies on his way to the top. Churchill formed a fierce attachment to the old admiral most regarded as an eccentric and a troublemaker. In late 1914, with World War I fully engaged, Churchill brought Fisher back as First Sea Lord. Many warned him this was a mistake, but he insisted that he could work with the older man. At 74, Fisher was old enough to be the 40-year-old Churchill’s father. Yet he had such a flow of ideas! Ultimately, events suggested that Churchill had made a serious error of judgment. He would have been better to harness the old Admiral’s energy by making him an adviser, rather than military head of the Navy. For a few months, it appeared these two very different personalities might make a go of it. They were polar opposites, down even to their working habits. Fisher retired early; Churchill was a night-owl. Oddly, this proved advantageous. Fisher rose early and often began work at 4am, writing Churchill a morning letter. His energy tapered off by tea-time, while Churchill, refreshed by his habitual siesta just after lunch, worked into the night. Fisher said this gave the Admiralty “very nearly a perpetual clock.” One night the cynical prime minister, H. H. Asquith glanced across Horse Guards Parade at the Admiralty lights, burning late. There, he imagined, must be Winston, brewing his cauldron like the witches in Macbeth. With solid research, Gough also makes crucial historical points. It was the Conservatives, more than the Liberals, who let Churchill “hang out to dry” when Fisher bolted from the Admiralty in May 1915. Churchill did not realize what thin ice he had been walking on. Equally important are Gough’s precise accounts of Churchill’s Antwerp expedition, his examination of the dirty business of the Lusitania, and disclosures of the horrors of the ill-fated naval war even before the Dardanelles expedition. The Dardanelles campaign in early 1915 aimed to send a fleet through the Dardanelles, appear off Constantinople, force Turkey out of the war, and relieve supply lines to the Russians, bottled up in the Black Sea. Its failure broke the Fisher-Churchill partnership. Yet, as Dr. Gough makes clear, it took months for them to reach the final boil. 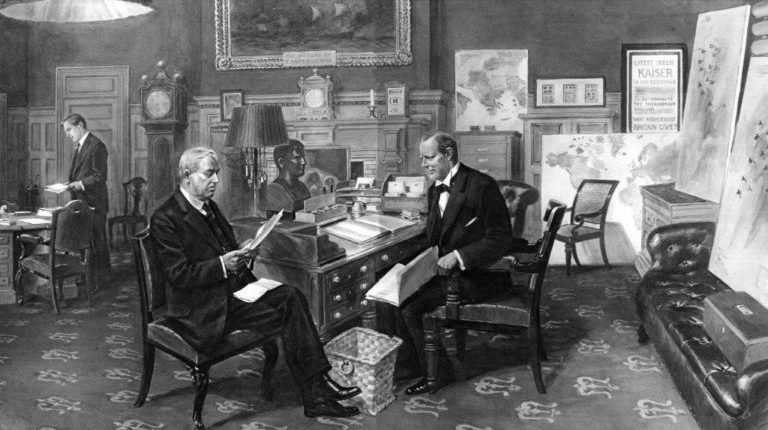 Then Fisher had the effrontery to write Asquith “the letter of a madman,” stating conditions under which he would deign to return and “guarantee the successful termination of the war.” One of them was that “Churchill must not be in the Cabinet.” It was an impossible challenge to civilian control of the military. Churchill did not learn of this until after Fisher was dead. Both men were frustrated at their sudden fall from power. Fisher fulminated, plotted, and wrote countless letters to all and sundry. But his career was clearly over, ended in considerable part by his growing megalomania. 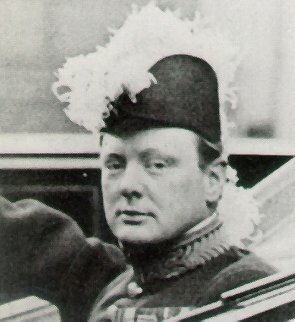 Churchill, however, after a short period in the political wilderness, eventually returned to the government as Minister of Munitions in July 1917. Barry Gough has written extensively on this website of the astonishing aftermath of the break-up. Still a Member of Parliament, Churchill returned from the Western Front in early 1916. From behind and before the scenes, he then engaged in what Gough calls one of his “most baffling political adventures”: a quixotic campaign to bring back Fisher as First Sea Lord. This time Fisher didn’t get his wish. But Churchill continued to court him, even as part of the new Lloyd George government. In March 1918, Siegfried Sassoon visited Churchill at the Ministry of Munitions in the Metropole Hotel—and Fisher was sitting there. Churchill’s infatuation, or at least faith and friendship, continued through Fisher’s death in July 1920. In May 1921, thanking a friend for sending him some of his letters to Fisher, Churchill said, “I am glad that we were friends at the end.” Another reviewer of this book, Jan Morris, wrote: “They made it up, as lovers do, and each grew up.” Did they? The relationship between the two titans is more obscure, and perhaps more interesting, in these last years of Fisher’s life. Barry Gough doesn’t let us down. He explores the period 1916-20 as skillfully as the early relationship. He seems to have left no relevant document unturned. The book unfolds with verve, keeping the reader briefed on numerous players and events. The result is a work sure to join the shelf of vital Churchill studies—one that adds to our knowledge of the period and of both figures. 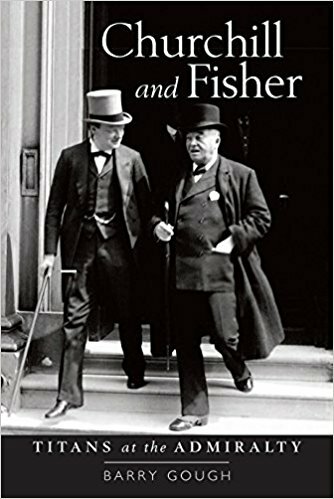 “Lord Fisher and His Biographer,” in Winston S. Churchill, Great Contemporaries. “‘Damn the Dardanelles, they will be our grave’ —Admiral Fisher,” by Barry Gough.